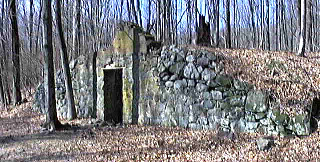 This was the village ice house. The building was set into the hillside and below ground. The roof was covered with dirt and sod; a big chestnut door sealed in the ice which was cut from several ponds here in the village and stored in sawdust, keeping cold year round. During the later years of village occupation, Cooper & Hewitt Company built several large ice houses at the end of the rail line at Sterling, New York, right on the state border. The lake used to freeze over then, and in a good year, as many as 350 railroad cars could be filled with ice in the summer and sent down to cities like Newark, Paterson or Jersey City. Once at its destination, ice was loaded onto a wagon and driven around the streets where people would order a block or two. The ice man would carry it up with his tongs and they would but it into their wooden box called an ... "ice box".